Six weeks ago we launched an API for our technology database, CrunchBase. The idea was to give away lots of clean, structured data about the companies we cover, data that could be used to build new services and improve upon existing ones. Since then we’ve seen a number of impressive things built on top of the API. And the traffic has started to add up: between July 15th and August 15th we fulfilled nearly 800,000 API requests, compared to ~1.3m page views for the website itself. We now have over 15 projects hooked up to CrunchBase with many others on the way. Developers interested in using CrunchBase data for their own projects should check out the API documentation. Today we wanted to highlight a few of the more sophisticated product integrations to date. Zemanta, a blogging enhancement tool that launched back in March, recently integrated CrunchBase so that publishers can easily slurp in extra information like company logos into their posts. 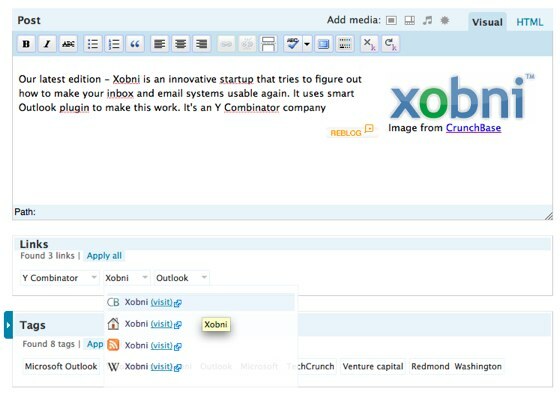 Zemanta’s product integrates closely into blogging platforms such as WordPress, and it helps to semantically link up parts of your post with sites from around the web (CrunchBase now included). These guys have been on our case (and rightly so) to release an API for a couple of months now, so it’s great to see their implementation go live. They even offer their own API which takes plain text as input (say, a blog post), and spits out correctly disambiguated CrunchBase entities. You can check out a demo of their product here. Nicolás Parziale has created a very cool flash app inspired by They Rule that visualizes the graph of connections throughout CrunchBase. 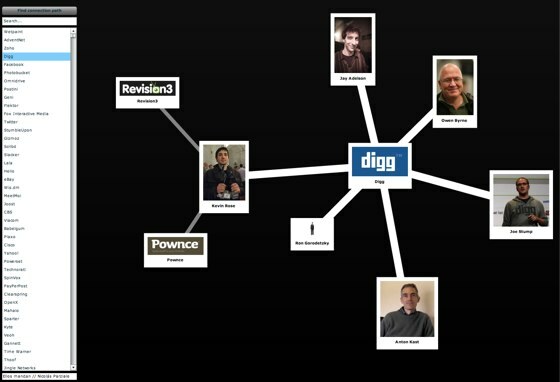 You can start with a company (such as Digg, shown below) and then flesh out different parts of the graph with your mouse. You can even input any two companies, causing the app to crawl the web and visually display all of the connections between the two.